Although Mr Wenger’s speech was indeed the real highlight of the affair, there was one moment that stole the show. Ivan Gazidis did his speech, which was a standard AGM intro about how things are going, with a particular statement about the 14 years of continual membership of the Champions League – a record only surpassed by Real Madrid and Manchester United. Some of the numbers were interesting. The HD programming on Arsenal Player reaches 110 million in 88 countries, and by the end of this season they expect 10 million followers on Facebook. He promised a few events for December, and also noted the slogans that have been put all the way around the ground. I noticed the one about Danskin as I walked around the stadium, and I think it is a shame from a historic point of view – so I guess I will just have to do a piece on the Uncovered column in the programme, saying that it wasn’t really Danskin who started the club. Anyway, then he sat down, and as we had been promised, Stan Kronke stood up. Now I must add here that when the running order was announced there were gasps of amazement from the crowd at the mention that Stan was going to speak. He wasn’t introduced – the chairman didn’t say, “And now Mr Kronke…” After Ivan Gazidis sat down Stan just got up and went to the microphone. I swear that 95% of the audience didn’t get the joke, but it really had some of us in stitches – we really thought for about 20 seconds he was just going to stay silent and then sit down again. But he did eventually speak – no notes, no hesitation. As an intro he said, “Some people have asked me to make a speech. I don’t know why.” So he made a speech about how he has known Arsenal for a long time, and how it was the only club he could think of buying into, and how he was in for the long term. And then came the questions. This year these were pre-planned nothing coming up from the floor. The questioner read the question and the chairman read the answer. Several times there was muttering from the floor that the chairman didn’t answer the questions, but in fact many of the questions were unanswerable in any other form. The questions were so broad as to be hopelessly vague, so they got a vague answer. Question: Is it time to review the self-sustaining financial model in order to bring success on the pitch. Answer: The self-sustaining model is the right way forwards, and the future is in our own hands. The point about the self-sustaining financial model is that it is, as the questioner hinted, one of many. Another approach is to do a Chelsea/Man City. Another is to follow Man U’s marketing model (and there were hints several times that next year’s figures will show the first real boost to the marketing revenue). Another is to do a Leeds or a Portsmouth. So what does a review of the SS model mean? It means saying do we want to go into huge debt, and the chairman said no. Not much of a debate, but then not much of a question really. There was one serious point in question 2 – the injection of money from a new equity offer. Here the answer was a straight no. So it went on. Some of the questions would obviously never get an answer: such as did Tom Fox (in marketing) get a bonus last year? No chairman of a plc is going to answer a question about an individual’s salary at an AGM unless the articles of the company insist that this is revealed – and indeed as Andy Kelly of the Arsenal History Society pointed out to me afterwards, Arsenal chairmen since Norris have been saying, as they are entitled to say, “I don’t have to answer that”. There was one question as to whether ticket prices would go down if we didn’t get into the Champions League next year – that wasn’t answered but you could see from the faces of the board it was thought to be a dumb question. We have high ticket prices to pay for players’ wages. If we pay less then players leave or don’t come in the first place. So if we were to drop out of the Champs League, and then reduce our income, what next? We get more players leaving and find it harder to get into the Champs League and the spiral of descent is built into the club. Who wants that? Of course the questioner might have had in mind some thought about other forms of finance – but then that was not in his question, so we won’t ever know. After that there was the inevitable request for the chairman to stand down, and hand over to David Dein. The chairman said he wouldn’t, and I was left wondering why such a question would be asked. Again it is a case of trying to wrap a highly complex issue into a single simple question. David Dein was against the Emirates and yet we have the Emirates. On such a major policy decision surely to bring back the major opponent of the scheme would be ludicrous. David Dein was (I believe, although obviously I have not seen the evidence) found to be negotiating behind the back of other board members against a policy decision already taken by the board. Again how could you bring him back? He clearly has a relationship with Mr Usmanov. How could that work when the board have turned down Mr Usmanov? As for Fanshare members, we were thrown some hope. The question was asked about making more shares available for Fanshare members, and the answer was that the matter was being considered. After that we were back to the criticisms of the board for not changing, for being out of touch and so on and so forth. For me at the time I thought that the answers from the chairman could have been written in a better way, but reading back through again I am not sure it would have made much difference to the show. The biggest round of applause was of course for Mr Wenger before and after his speech. That’s the subject of the next report. Man U 1 Man C 6: The ref can get it right when he tries. MEDIA WATCH: From a one man team to a club in crisis! REF WATCH: Clarifying the way in which reviews are done. REF REVIEW: Liverpool 1 Man U 1, Man U get the most wrong calls. MEDIA WATCH: A change in tone. But is it a positive one? 15 comments to UNTOLD at the AGM. What the reports don’t say: Silent Stan’s great joke. Thanks it is great to have a person who knows about the club giving Feedback. I don’t care who the guy is or what are his motives. If he owns approaching 1/3rd of the Club’s shares, he is entitled to a seat on the Board. Stan is a billionaire and owns 70%..that makes him the owner. He need not say anything. He only spoke out of respect for the club and the fans. The day to day running is down to the board, Gazides and Wenger. The anachronistic Hill Wood, decent chap that he is will always be shot at especially as most fans know that Dein and Wenger are the dream ticket. I think Wenger has been very clever in this respect but Gazides is Stans man…. end of. I attended the meeting and to be honest there were 2 good points. 1 there were far fewer of us so i actually managed to get close enough to hear. 2. the biscuits. The rest of it was a complete waste of time. Because the questions were not pre selected we ended with random questions that were so aimless and so personal that the answers were either vague or unanswerable. i think the club decided on this format for exactly that reason. wenger was placed in a position where is no longer answerable to the shareholders. for me this was the second biggest statement behind silent stan showing that he can actually speak. i think the fact that wenger was only afforded a talk shows that he now answers to the board and it is they alone that will ask questions of him. Thanks for enlightening us Tony. Bc & Nicky- do you know Usmanov? Have you ever thought there might be very good reasons for not inviting him onto the board, reasons that are best not disclosed? Is it not better to have a united board that has run the club, as well as any other in the world,to provide a platform to make the playing side as competitive as it can be without selling the Club’s soul? Goodness knows I find plenty to disagree with the board about & some of the PR, or lack of, makes me cringe but nothing like the embarrassment caused by the likes of the vociferous AST, who seem to want to find fault with every little thing about our great Club. We live in the age not only of the instant but also where everybody without the any responsibility knows best how to do the job of those that actually have it. The wannabes of AST do not represent me, or I believe any majority of our support, in any shape or form. I wish the media would stop portraying them as Our mouthpiece. AW’s call for unity is very relevant. let’s see how many take this up & actually support the club at a difficult time. @ Flint McCullough – very well said, I agree fully. I have no idea who BC & Nicky know, because I do NOT want the Uzbek on the board. In fact I hope that he is forced to divest in the next three years. Most corporate AGMs are sedate affairs and I have no idea why there were ideas that the Arsenal would errupt into slanging match or fisty cuffs. I think that since we are seven years down the line of the self sustaining model (which has begun to bare fruit) and people are still questioning it, I think they should sell their shares or offer their personal finances to the club so that we can pay the players more. @ Tony, I forgot to say that this article is an interesting ‘inside’ perspective. It amazes me that there is such a strong desire to focus on only negatives about the club, when in reality we are doing rather well on and off the pitch. In my opinion Arsene Wenger, Ivan Gazidis and the rest of the board have been good custodians of the club and in these challenging economic times have done exceptionally well. Surely it can’t be the role of the Arsenal supporter to continually talk the club down at every opportunity? I am all for constructive criticism, especially when this is twinned with realistic and viable solutions but this endless negativity is just pointless and silly. I’ve been looking forward to this report from Untold. It’s quality, just as I expected. 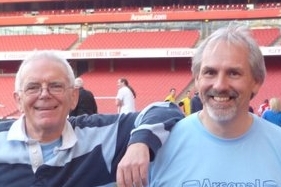 Individuals such as Tim Peyton, Peter Wood (le grove) et al, if given a free rein at the Arsenal Holdings AGM, would be seeking cheap publicity for their own agenda. Especially after the somewhat over-fevered reaction to the ruptions and disruptions of the late summer! The journalists were of course looking forward to a free-for-all. To expect Mr Kroenke and Mr Usmanov to be soul companions at this late stage in their careers, is impossible. An olive branch would be possible with the London Olympics in 2012, to offer the facilities at London Colney for the Russian gymnasts to use. With a renaming of London Colney to one of Mr Usmanov’s companies (Yahoo anyone???) for £20 millions over 10 years, even Mr Wenger would think twice and then thrice. It is surely in the interests of the two main shareholdings, KSE and Red&White, to row together as in sculling! Thank you, Tony, for a balanced report. Next year’s AGM will be an entirely different affair. In fact there might not be one as we may only have 1 shareholder. Usmanov has been hoovering up shares at quite a rate this year. At the present rate he will hit 30% in mid-January and will be obliged to offer Stan £14,000 for his shares. Stan is a businessman and I can’t see him turning down a 20% profit on the shares he bought from the board and Lady Nina earlier this year, and 40+% on the shares he bought before then. If Stan sells then I believe that will give Usmanov more than 95% which means he can buy the remaining 5% without opposition from the shareholders. That would be a terrible betrayal. Bad enough that I’m not even going to bother thinking about it right now. If it happens it happens, but hopefully it won’t. Gooner Gal Is there ANY criticism of Gazidis,Arsene Wenger and the Board on this site? I have yet to see any constructive criticism. Sorry but your comments just strike me as being either sycophantic or simply uncritical- in keeping with the main ethos of this site. “Doing rather well on or off the field”-well it depends what you expect. Personally I would not have said that about our commercial revenue-or our playing standards in relation to our competitors. The very best that can be achieved this year is that we scrape into ECL again. Thats no mean feat- and it may not happen as we have two opponents for the fourth spot who have stronger squads than us who have both already beaten us this season. However, I did not attend this meeting but have spoken directly to a couple of people who did and have seen Arsene Wenger’s speech-and what seems clear is that the chairman’s responses were rather curt and dismissive towards any questioning of policy and direction of the club by other shareholders. His responses to questions about the need to raise equity do leave serious unanswered questions-like just how will we be able to keep the likes of RVP and our other top young players from joining rival clubs paying higher salaries? It does seem a waste of time asking this Board questions because they are clearly not going to change course-even if they were shouted downy 2/3rds of the shareholders present. The reason Kroenke has been embraced by this Board is because he will block any attempt of a take over by R&W. Kroenke will never sell to Usmanov-no matter what he is offered- the one thing he isn’t is short-termist. Arsene Wengers’ unity speech was a very impressive piece of oratory worthy of a politician and he appears to be the real leader of this club-the one who at least has a vision for the club on the field-even if it is not a totally convincing one. @ Gooner Gerry, What exactly are you yapping on about? I think you really need to expand your ‘sycophantic or simply uncritical’ comments (which made me laugh out loud). I am not going to start going over old ground about the current commercial deals with Nike and Emirates as I would of hoped that prior to writing your post, you would have at least little background knowledge about those deals. The successful Asian tour, the interesting marketing strategies deployed for home games, the new partnerships entered into are a few things that we have witnessed over the past 12 months and I was referring to. I expect there will be much more in the pipeline as we continue to win more fans all over the world. The commercial side is not perfect and I could think of a few avenues not yet fully exploited. But crucially you don’t know all the areas of expansion the club is considering and what deals are being put together. The key thing is that we have not remained static or lost key partners due to our trophy drought. Moving on to your comments about our squad, am I right in assuming you were refering to Liverpool and Tottenham as having stronger squads than us? I would disagree (is that an example of what you meant when you called me sycophantic or simply uncritical?) as I believe that we are going from strength to strength and now have a team that can compete with all the teams vying for the top spot, not just 4th place. I note that you wrote this post just after we beat Chelsea 5-3, so I know that there isn’t much else I can say that will convince you that the team is good enough. So moving on to your second hand info about the AGM, Peter Hill-Wood is of a different time and definately has a certain manner about him but make no mistake he is not stupid, he loves the club and recognises how far it has come. He doesn’t suffer fools gladly and quite possibly struggled to respond to the asinine questions as eloquantly as one might of hoped. Nethertheless, I don’t believe that anyone in their right mind would believe that Arsenal would really struggle to raise finance with their healthy books and increasing year on year brand value from a bank, venture capiatlist or government! Here’s the thing gerry, Arsenal despite what the press say are not a one man team. RVP is not bigger than the club and therefore should not of been the focus of the meeting. Incidently, in 2009 some fans were demanding that RVP was sold and angry that we had not tried to get Ruud Van Nisteroy instead, when RVP signed on for another 4 years some loud voices were saying it was a waste of money and Wenger was wrong to keep him around. In any event, players come and go and it isn’t always about money either. Another point gerry, is that the AGM is not a working mens club forum and you are right that about 150 shareholders with the combined ownership totalling .00001% (there are more 000’s but you get the point), shouting at the guy who owns most of the organisation would not of been productive. It might of given John Cross the newspaper headline he was looking for though, but it wouldn’t of been useful. Again gerry, even if 2/3rds or all of the AGM attendees screamed at the top of their lungs, they make up about .0000001% (see above brackets) of Arsenal’s stakeholders. There are quite a few supporters out there that understand what Arsenal are doing and do not think that the Man C or Chelsea model of ownership is feasable in the long term. It should be a source or comfort that the club, which has been in existance for over a 100 years will not go bankrupt, if God forbid it misses out on the 4th CL spot, loses season ticket holders, gets relegated etc. I am pretty sure that if Jabba the hun had been a decent chap, he would of been embraced by the board too. I think that if Jabba goes, Kroenke would be more open to the idea of making more shares available to the Arsenal Fanshare scheme. I also agree with you gerry that Arsene Wenger is a massive influence at the club on and off the pitch at Arsenal. The building of London Colney and recently new state of the art medical facilities are testament to that. I am guessing you might of seen the free video on Arsenal Player where the medical and ground staff say as much too. Man C announced plans to copy it earlier this year funnily enough. Finally in terms of you not being totally convinced…..well you can’t please all of the people all of the time. Some people’s cups are always half empty after all. I don’t normally bother correcting my mistakes, but in this instance I will clarify that I meant to say ‘Again gerry, even if 2/3rds or all of the AGM attendees screamed at the top of their lungs, they make up about .0000001% (see above brackets) of Arsenal’s GLOBAL stakeholders’.